There’s no doubt that horse shopping online is convenient. Who wouldn’t want to buy a horse from the comfort of their own home (or barn, and possibly in their pajamas)? But to make these sales happen, a long, boring home video just won’t do. 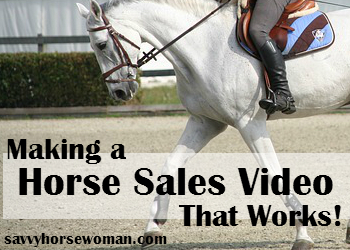 Follow these tips to make a professional looking horse sales video that really works. Save time, money and hassle by attracting the right buyers. Do keep it short. 10 minutes max! Do be honest. Show off your horse’s best features, but don’t hide the negatives. Don’t allow distractions. Keep people, cars, dogs and other horses out of the video. Do a practice run. Check lighting and different angles and set up the arena accordingly. Do use a tripod (like this one). They’re inexpensive and much better than a shaky hand. 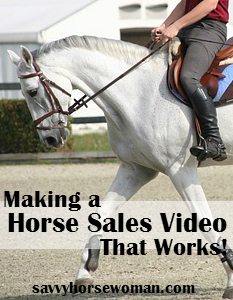 Do shoot the video at eye level to get the best view of your horse’s movement. Do clean up. Remove extra jumps and drag the arena before you begin. Don’t make comments. Let your horse’s performance do the talking! Do have the horse & rider neatly turned out. The rider should have “horse-show hair” with a helmet, a neutral colored polo or sweater, tucked in with a belt, breeches and tall boots. Your horse should be turned out as if it were a show, minus the braids (and boots). To make a good first impression, use high quality, modern tack and apparel. Check for equestrian clearance online so you’re not paying top dollar at the last minute. This segment should last about 2 minutes tops (with the exception of young horses and broodmares). Don’t start filming until your horse is stood up properly, balanced and looking straight ahead. Be patient, and have a helper keep his attention. Shoot each side for about 10 seconds, making sure to stop filming in-between. For the front and hind view, keep an eye out for shadows that could make your horse look uneven. If your horse has a scar, injury, or major conformation flaw, be sure to include that in the video and inform the buyer of how it affects him (don’t try to hide it!). If your horse is going well under saddle this portion can be brief, or skipped completely if you’re short on time. For a young horse or broodmare this is your chance to let them shine so it’s important to set them up for success. Practice working in hand, particularity at the trot in an area with firm level footing. Shoot several passes back and forth giving a side view of the walk and trot, then directly towards and away from the camera. Unless your horse is well balanced and a real pro on the lunge line, it’s usually not the best way to showcase movement. Instead show your horse at liberty in an arena or round pen doing a controlled trot and canter that represents how they would move under saddle. Warm your horse up off camera long enough to have him attentive and moving forward, but not so long he’s tired or sweaty. Show a relaxed walk for several seconds, then a transition into trot, going both directions for at least a minute. Do the same with the canter. From there you can show off your horse’s strong points, doing lead changes, leg yields or whatever movements will be accurate and consistent. Resist the temptation to add anything new you’ve been schooling. Editing is key for this section, as even the best horse/rider pairs can make unflattering mistakes over fences. Ideally buyers would like to see a continuous course, but if your horse isn’t consistent instead show a few simple exercises and lines you know he’ll excel at. Set the fences at a comfortable height, for both horse and rider, so the pair looks relaxed and capable. Do several takes and only use the best footage! Instead of an abrupt ending over fences, show your horse making a closing circle and coming down to a walk on a loose rein. Now is the time to get a bit artsy and zoom into your horse’s relaxed expression and perked ears to leave a good lasting impression. A subtle pat from the rider is fine, but don’t be too enthusiastic. It may give the impression his good performance was just a fluke, not his regular behavior. This is a great article for anyone that is selling a horse or promoting a stallion.